GWK means Garuda＝name of bird, Wisnu＝name of Water God, and Kencana＝vihecle. 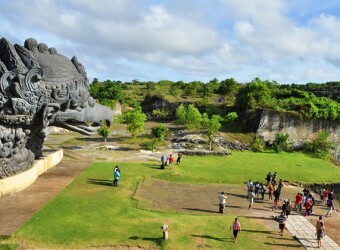 It is impressive that the background dramatic view of big statues of Wisnu and Garuda and beautiful panorama view. All area of the park is organized as sightseeing and recreation spot, in addition, many kinds of event such as the art performance, exhibition, meeting, etc. are held. I could overlook Benoa Bay and Jimbaran. The scenery is beautiful. I watched free dance performance here. At last I took pictures with the dancers.